← Frugal Tuesday Tip: Who wants to win? I write about our area’s hidden treasures over at my Examiner column. While I’ve been in the Jordan House several times, I’ve never had a formal tour of the house, owned by the West Des Moines Historical Society, until this week. James C. Jordan, an abolitionist in Valley Junction, now called West Des Moines, built this house on his 1,800 acre property. “I” of GAIN and I toured his home with a home school group on Friday. If you are in town, I highly recommend a guided tour. We were able to view most of the 16 rooms in the house. The tour guide showed us items that were owned by Jordan and his family and spoke about many others items. Even before all 16 rooms were built, the house was a gathering spot for many functions. 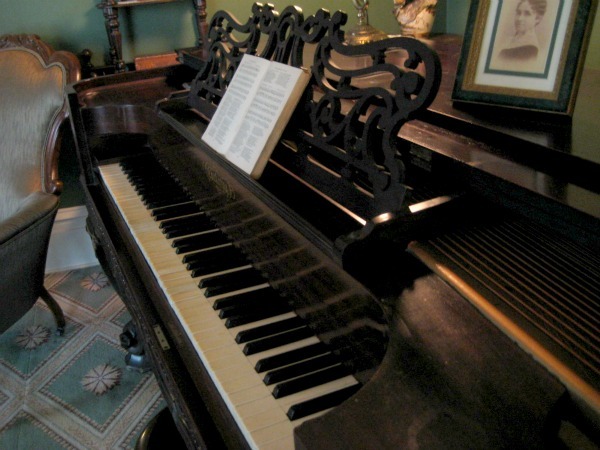 This piano was assembled in the formal parlor, where the functions occurred, shortly after the Civil War and has not left the room since. You can see and read more in the WDM Historical Society’s virtual tour. I took photos of a few other things because they reminded me of my antique store grandparents, like this cribbage board. 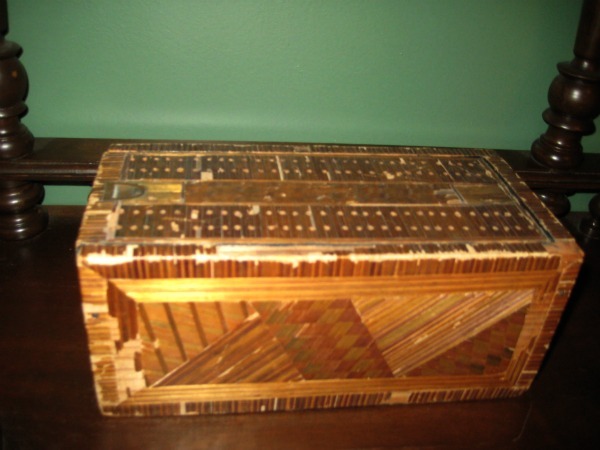 My grandparents taught me to play cribbage, and my aunts Luella and Clara would play in cribbage tournaments. They would coach us over our shoulders. Nowadays, I always try to make decisions that would make them proud of my cribbage game. 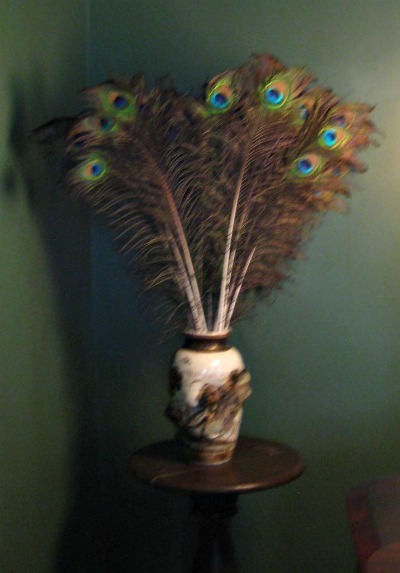 That same grandmother kept a vase of peacock feathers in her spare bedroom. 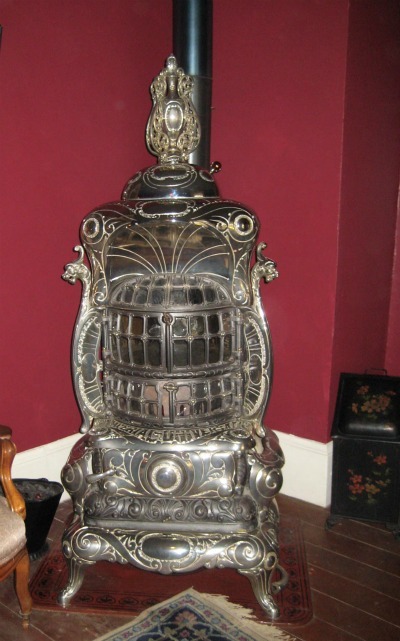 The Jordans kept their vase of feathers in the formal parlor. Lastly, this transitional stove was in Jordan’s back parlor. It reminds me of my maternal grandmother because of the isinglass, or muscovite, which is “white mica.” Her family name was Iseminger, and she told me that one of her family discovered the use of mica for windows. The word came from their name. I can’t find anything to confirm this, so if you have information, please send it. I happen to be a new-this-year member of the WDM Historical Society, and one of the perks of membership is the free cookbook. With its hardcover and 300 pages worth of recipes with color photographs of the house, it is a steal at $5. I made the Tuscan Pork Roast last night and it was great! There are many more fantastic things that simply will not fit in this blog’s space. The Jordan House is so full, that you need to visit for yourself. It’s grand at Christmas time if you don’t make it this month. This entry was posted in etc., home schooling and tagged jordan house, WDMHS. Bookmark the permalink.